My wife and I, now aged 75 and 76 respectively and both committed automatic drivers, run two older Jaguars, mine a 2000 XK8 with 74,000 miles and hers a 2004 X-Type 2.5 AWD estate with 75,000 miles, both of which are run exclusively on Shell Nitro+, resulting in improving emissions and consumption figures year on year over the last three years (thus proving an excellent testimonial to your oft-repeated recommendation). We currently need two cars, living some miles out in the country and hence the AWD, but realise that with advancing years we need to look ahead a little, since I can’t help wondering if the time has come to sell or trade in my much loved XK and take out a PCP on a Suzuki Vitara S 1.4 BoosterJet Allgrip, (unless you recommend any other such car with torque converter auto). My quandary is I just wonder how long it is sensible to hold on to the XK whilst it is still worth something and suspect there are probably too many of them still around to merit any classic status, at least in my lifetime? The X-Type estate is younger, but clearly worth less - except to my wife of course - and any money raised from selling either, by whatever is the best means, would go towards a PCP initial payment (although this can be funded from other resources). But which? 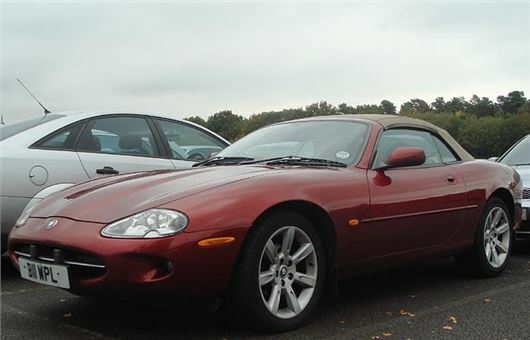 Both cars are well looked after by an excellent small independent Jaguar specialist run by an ex-JLR manager, and are running smoothly with no known problems, but I am reminded to mention that, in the 11 years I have had the 16 year old XK, there has never been any specific need to service the automatic transmission. I would love the vast improvement in fuel consumption of a modern car, but I would certainly miss the wonderful V8 acceleration. However, 16 years seems a very long time for the same transmission fluid. I therefore wonder whether, irrespective of selling or not, I should be heading for the fedauto people at Westbury in Wiltshire. I have heard it said that the very act of replacing the relevant auto fluid can dislodge “detritus” which would have been better left undisturbed if downstream damage is to be avoided. It will also need a full set of new tyres very soon, and I suspect that you would tell me either that Michelin Cross Climates are not available in 245/45R18 and 255/55R18, or if so perhaps not appropriate for such a car? Yes, the Suzuki Vitara 1.4T Boosterjet is a good choice with its 6-speed torque converter automatic transmission. I'd be inclined to keep the XK8. It has probably bottomed out in depreciation. But it is worth getting the transmission fluid checked by a member of http://www.fedauto,co.uk and changed if it has badly discoloured or burned. Sorry, no CrossClimates in those widths, but better to keep the Jag garaged over the winter months anyway, hooked up to a battery conditioning float charger. Definitely keep it away from salted roads. My 91 and 92 year old parents follow my advice about Shell V-Power and, possibly as a result, my mother's 15 year old Yaris passed its MoT last Thursday and the total bill + service was a mere £96. Do you have any 'real world' mpg figures for the 220i? BMW reckons about 47 mpg - but I guess the auto gearbox would be rated differently so could be rather less - and of course the manufacturers figures are always on the high side, anyway. The 218i BMW figures would be 55mpg which is appealing - but I'm torn. Test drive now arranged. Can you help me to find someone selling ex-police vehicles in the Portsmouth area, please? I looked on-line, and Police sales of LCVs are held in Glasgow, apparently, and by BCA in the London area or Bridgewater as far as the South is concerned. My son is looking for a Peugeot Expert Professional or similar, having acquired an ex-police smaller Peugeot dog van some years ago, which gave sterling service until old age caught up with it. Brightwells in Leominster and West Oxfordshire Motor Auctions in Witney. They are the main police auctions. Police vehicles are not subject to MoTs so unless the auction house gets them MoTd you’d need to have the vehicle delivered. I was wondering if you could help with a problem my dad has. He is 83 years old and, unfortunately, just found out he has not had a valid driving licence since 1976, which he had no idea about. He has been told he needs to re-sit his driving test. Can you please let me know if this is correct? There is no way he could do the theory part. He needs to be able to drive, as my Mum is very ill and needs to attend numerous appointments. Is it me or do others have the same problem with modern cars and their indicators? I drive a Peugeot 3008 and whenever I have my headlights on during daytime, other drivers appear to have difficulty seeing the indicators and often give me abuse. I have also had problems myself with large 4x4s where the headlights and indicators are next to each other which do make it difficult to see. Are manufacturers aware of this and choose to ignore it, or are there plans to redesign? I look forward to your comments. In a word, yes. For example the DRLs of Jaguars switch off that side when the indicators are working. I am considering the purchase of a 2012 Mercedes Benz SLK in Red. I understand there exists a problem of micro blistering with this paint colour. Is this correct, if so what is the cause? There is definitely a problem with Mars Red on Mercedes from 2010 and Mercedes is paying for the cars to be stripped back to the metal, properly treated and properly repainted. We recently replaced one 2004 Polo SDi with another (with lower miles). The cars are identical and have the same engine code. Both cars were and are driven in exactly the same way - a mixture of motorway and non-motorway journeys. In the two years that we had the previous car we never had to top up the oil between services. It's only a month since we bought the replacement Polo and already we have had to top up the oil twice, even though the car was supposedly serviced before we collected it by the garage it came from. In the month that we've had the car we have driven 1,500 miles in it. The garage claims that every car is different and that it's not uncommon to have to top up oil so frequently. We haven't noticed any signs of oil leaking. What do you think? Might be the piston rings, might be the valve stem oil seals, won't be the turbo bearing oil seal because an SDI doesn't have a turbo. I have had problems with the CVT on my Nissan Note. I am considering replacing it with a Suzuki SX4 with CVT. Is this the same unit as used by Nissan? Which other manufactures use the same CVT? What alternative autos are available on similar vehicles? Nissan owns a controlling interest in JATCO that supplies CVTs to Nissan, Chrysler, GM, Mi­tsu­bishi, and Suzuki. Audi, Honda, Hyundai, Subaru, and Toyota all make their own CVTs. Generally CVTs on Hondas and Toyotas work best, but if you want to avoid CVTs and dual clutch transmissions on this size of car go for a Mazda 2 or a Mazda CX3 with 6-speed torque converter transmission or a small Citroen or Peugeot with the EAT6 torque converter transmission. We moved house about 15 months ago, and throughout the summer holiday season in 2015 we were plagued by people using our drive to turn. This mostly ceased during autumn and we forgot all about it until now that the summer holidays have started again, and we have what seems like a procession of cars turning on our private drive daily. Some even drive up to the house and attempt to turn in our often congested parking area near the front door. We live in a rural location alongside an unclassified but busy road that carries lots of commuter traffic and, at holiday times, people going to the local beaches. Yesterday, I learned that this is happening because about 200 yards away from our house, there is a road junction where the straight through road does not have right of way and the road turning left towards my house (which is the busier road) is marked out as the main road. Traffic travelling by satnav to certain destinations will not be given any instructions it they approaches this junction if its routes involve travelling straight ahead on the minor road. So most drivers, follow the road markings around the bend to the left, whereupon if they should have travelled straight ahead, their satnavs tell them to “please make a U turn” as they approach my house. The question, is what to do about it? I could take a Christian attitude and allow it to continue, but there are problems with that. One is that the majority of people who do this, enter forwards, then reverse out of my driveway on to a fairly busy fast road with poor visibility. Another problem is that those who drive up to the house, then turn, or attempt to turn there are at risk of damaging our vehicles and our potted plants. The third issue is that we enjoy our privacy and don't really like the public intruding in this way. We have a gate that is set more than one vehicle length back from the road, so keeping that closed only prevents them driving up to the house. It does not prevent them intruding on our privacy nor the risk to other traffic on the road. I could place cones at the road boundary to stop this happening, but that will constantly hinder the movements of my family and legitimate visitors to the house. I could ask the council to change the priority markings on the junction to give traffic going straight ahead priority, which will mean people will not make this wrong left turn constantly (fat chance of the council doing that). Or I could approach the trade association of the sat nav companies and ask them to change the instructions at this point, but I do not know whether that is possible. HJ, what do you think? Simply close the gate and put a notice on it: “Private Property. No Public Access. DANGER. If reversing out, have someone check for traffic.” Let them continue to turn in the vehicle length before the gate. I want my next car to be autonomous. I have been around the showrooms and none of the salesmen can tell me when there may be a launch. Have you any information when this may be and what model it may be? Just pop into your local Tesla showroom. However, I should warn you that the system has not yet been fully perfected and cannot always detect when a huge truck has pulled across your path. So better not get too engrossed in any movies while being driven by one. And remember that the law has not yet caught up with the fact that the car is in charge rather than you, so you better stay off the Tempranillo. Alternatively, pay a fortune parking your car for a day in the Podway carpark at Heathrow Terminal 5, then spend the day trundling back and forth between the carpark and the terminal in a driverless pod. You'll be amazed.